Foldable box with altar inside. 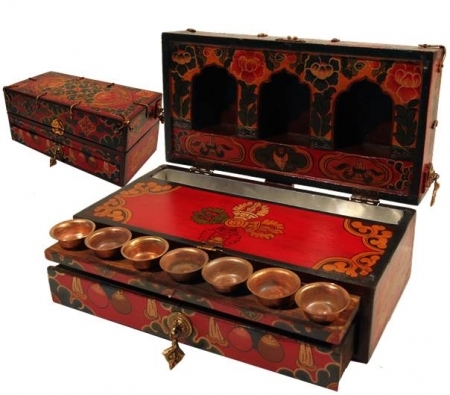 When you open the box there is room for 3 small statues and a metal tray for incense. The decorations are antique looking handiwork and could show some deliberately applied lesions; these are no flaws. At the front a drawer with 7 little offering bowls and an extensible board where you can put the bowls. At the side there is a drawer for storing your incense. Disclaimer: Handcrafted paintings are never exactly the same as depicted! This item will be only despatched to an address confirmed by Paypal.